be seen in the photo, below. lower, though, than it is in the 1-chip Sony camcorders). With motion, contrasty subject edges show more "flapping"
smaller PC120 and PC115) is quite remarkably good in sharpness and color quality for a 1-chip camcorder. look fine at 640x480...), and the TRV30 (but not the PC115/120) must be removed from a tripod to change tape. 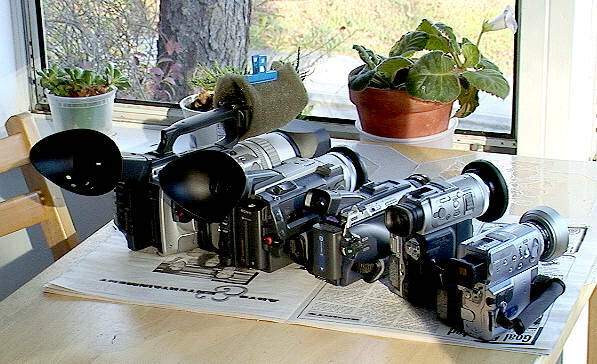 Extremely compact and light (about 2/3rds the size of the small PC100), I use this camera as a "pole" or "clamp"
All of this is copyrighted material (David Ruether, 2002-2007), and may not be reproduced without permission.